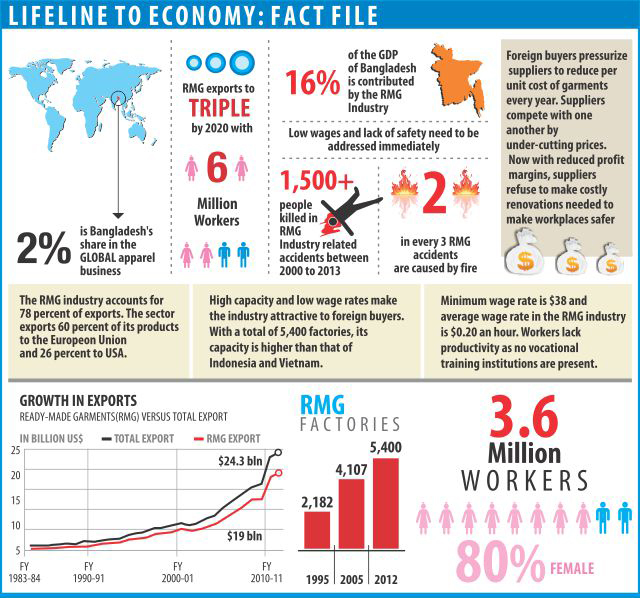 The advantage enjoyed by Bangladesh in readymade garment (RMG) sector cannot be taken for granted, and the country’s competitiveness in the apparel export market may erode in the long run if working conditions do not improve, says the World Bank in its Bangladesh Development Update October 2014. Apart from costs, Bangladesh still holds the advantage of capacity and ability to handle large volumes of orders in a timely manner. However, Bangladesh’s advantage cannot be taken for granted. Increased attention to compliance has led buyers to reconsider their supplier base in Bangladesh and search for new alternatives, which might result in fewer orders placed in Bangladesh in the future. Although progress in improving workplace compliance is on track, more needs to be done in order to fulfill the commitment of raising it to international standard. Safety compliance is improving, but there is no place for complacency. Sustainable compliant industry warrants constant monitoring and continued action by the stakeholders. Implementation progress of the amendments made in the Labor Law is extremely slow with a weak monitoring mechanism, and the Government needs to expedite enforcement of labor rights, says the report. Lack of coordination among the global brands is leading to inspection fatigue for some manufacturers and creating confusion. The report suggests that buyers should improve coordination on factory inspection and shift gear towards assisting the implementation of remediation measures. On the other hand, cooperation among garment manufacturers needs to improve. Citing a BGMEA survey, the report says the implementation of new minimum wage scale was slower than expected as 40 percent factories could not implement the new rate at the agreed time of December 2013.